New features in Modul8; for more shots, see Modul8’s Flickr stream. 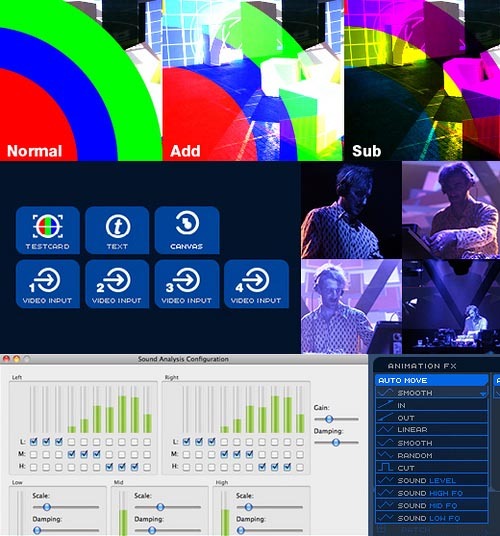 Mac-only visual tool Modul8 is getting some significant improvements in version 2.6, available now as public beta. The final version will cost EUR49. Snow Leopard users, this corrects some compatibility issues with Apple’s new OS, which I believe now brings all the major visual apps in line with 10.6 (VDMX, Resolume, and GrandVJ all confirm compatibility). Some of this has been available in Modul8’s competitors, but I know Modul8 has a loyal user base who like its integrated interface. Modul8 2.6 Public Beta with complete change list, bug fixes, etc. This is a public beta, and not recommended for “production purposes” – not that I haven’t seen people running betas live, of course. Let us know what you think, and particularly if we have Modul8 users out there who want to share their work.